The most complete assortment of sizes and finishes for that "timeless" hi-performance look. 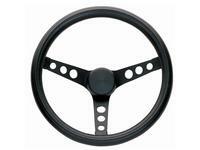 The Grant Classic Foam Steering wheels feature extra thick foam cushion grip. The Grant Classic Foam Steering wheel spokes are CRS steel in matte black or brilliant chrome with matching horn buttons. Black Spoke, Classic Foam Wheel. Black foam cushion grip with high performance matte black powder coated spokes, 3 spoke design. 11-1/2" diameter, 3-3/4" dish. Black Spoke, Classic Foam Wheel. Black foam cushion grip with high performance matte black powder coated spokes, 3 spoke design. 13-1/2" diameter, 3-1/2" dish. Black foam cushion grip with chrome spokes, 3 spoke design. 8-1/2" diameter, 4-1/2" dish. Grant 13-1/2" Classic Wheel. Black foam cushion grip, chrome spokes, 3 spoke design. 13-1/2" diameter, 2" dish. Grant 14-1/2" Classic Wheel. Black foam cushion grip, chrome spokes, 3 spoke design. 14-1/2" diameter, 3 1/2" dish. Grant 10-1/2" Classic Wheel. Black foam cushion grip, chrome spokes, 3 spoke design. 10" diameter, 5-1/2" dish. Grant 13-1/2" Classic Wheel. Black foam cushion grip with chrome spokes, 3 spoke design. 13-1/2" diameter, 3-1/2" dish.